Mr. Doodle! is a modern adaptation of the famous retro 80's arcade. The concept of the game is very simple - your task is to go through all the levels, gaining points by killing monsters and collecting bonuses! The main character, funny runner Mr. Doodle will not stop before achieve his goal - to run away from pesky opponents and to collect all the fruits in a cave. By digging the ground, he skillfully avoids collisions with monsters, leading them into a trap, and eliminates the enemies by dropping apples on their heads. But be careful, the number of apples is limited, can you calculate everything correctly and help Mr. Doodle to pass the level ?! - Receive a gift of an extra life! - Special treasure: did you find a diamond hidden inside apple? Modern graphics accompanied by the typical 8-bit melodies and sound effects. This combination is an indispensable complement to this fun and challenging puzzle! 1) Swipe & Tap (by default). Swipe any where on the screen with your finger in direction you want to move, then release finger to stop. Short tap any where to fire. You can also fire while running, just tap with your second finger while holding down the first (i.e. two fingers down = fire). 2) Joystick A. Classic type of onscreen joystick, where d-pad is intended to move in four directions. D-pad is in the bottom left, and the Fire button is in the bottom right corner of the screen. 3) Joystick B. Alternate onscreen joystick. Buttons are split. Left/Right buttons are in the bottom left, and Up/Down/Fire buttons are in the bottom right corner of the screen. 4) If you have MFI compatible gamepad device (like Logitech Powershell, Mad Catz C.T.R.L.i etc.) 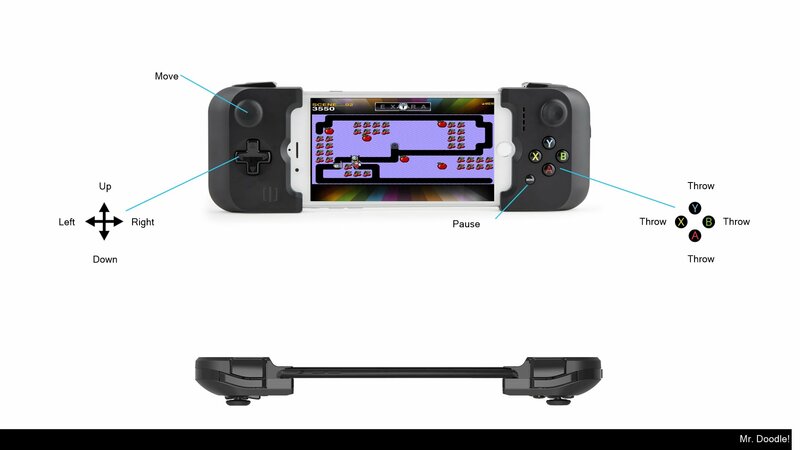 connected to your iPhone/iPad, you can use it with this game to feel all the beauty of playing this retro arcade game with a real joystick device! 5) iCade and GameDock is supported automatically.